In rooms and also in air ducts, various humidity limit values must be complied with in many production processes. High-quality moisture meters allow quick and easy control of the various parameters and offer a simple and powerful way to monitor both humidity and temperature consistently. Additionally, so-called dampening switches are used in the field of moisture monitoring, which close the circuit upon reaching a certain limit value and thus initiate a reaction. 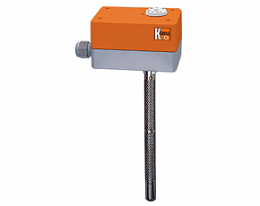 In addition to these permanently installed humidity measuring devices, there are different versions of portable hand-held sensors, which can be used in a wide variety of application areas. These professional humidity meters often differ significantly from the usual commercially available devices and offer both a high working comfort and a very low measuring tolerance. Thus, humidity and temperature of various environments and materials can be tested optimally and professionally. High-quality moisture meters, such as the humidity / temperature meter AFH-G from Kobold, use several plastic tissue tapes with 90 individual fibres as moisture measuring elements. Due to the absorption of moisture from the tested air, the length of the fibres changes measurably, which allows an exact determination of the humidity. The resulting signals can be forwarded via various output signals and integrated into various test and automation processes. 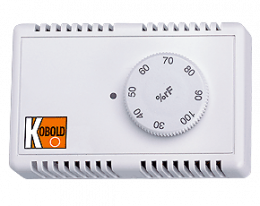 This high flexibility in combination with high measuring accuracy makes humidity monitoring with Kobold humidity transmitters extremely easy. High flexibility in the processing of output signals allows an easy and uncomplicated integration into most varied industrial systems and allows a permanent control of moisture in most varied areas. In addition, humidity meters of this type are very low in maintenance and do not require any regeneration, as is the case with other devices with other humidity measuring elements. The sensitivity of these devices remains within the measuring tolerance until the measuring elements of humidity measuring device is damaged by external influences.. These devices are thus ideally suited for long-term use in areas which are difficult to reach and can be permanently installed. The humidity switches from Kobold work on a similar principle. These humidity switches, such as space hygrostat AFS-G2, also work with the plastic woven bands with individual fibres. Maximum allowable humidity can be precisely determined using the set-point knob. If this value is reached, a microswitch is actuated via expansion of the plastic tissue tapes, which triggers the desired effect. 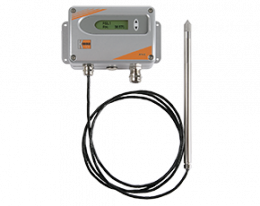 This makes it easy to automate systems in the field of moisture monitoring, since they automatically react when the limit values are reached and carry out the previously defined actions. Especially for safety-relevant areas of production, it is an important and simple procedure with only a small risk potential. Maximum allowable humidity can be precisely determined using the set-point knob. If this value is reached, a microswitch is actuated via expansion of the plastic tissue tapes, which triggers the desired effect. 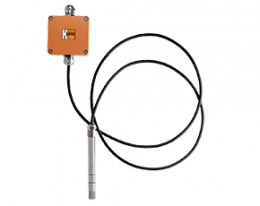 This makes it easy to automate systems in the field of moisture monitoring, since they automatically react when the limit values are reached and carry out the previously defined actions. Especially for safety-relevant areas of production, it is an important and simple procedure with only a small risk potential. If someone wants to purchase humidity meters, he has to pay attention to various factors. 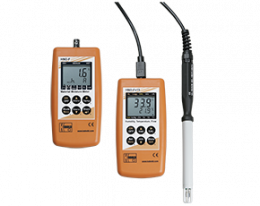 The profi humidity meters from Kobold are also available in various hand-held measuring instrument versions and are attractive due to their easy handling and their large range of functions. If you want to measure the humidity and temperature, in many cases you do not find a suitable hand tool. 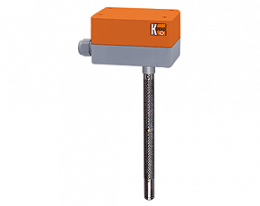 Humidity measuring instruments are available in a wide variety of designs and can not only determine the material moisture, but also determine the moisture content, the flow and even the temperature. Thus, a whole range of critical factors can be easily determined with just one device. 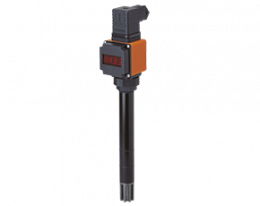 Thanks to a whole range of accessories and additional features, such a humidity meter can be optimally and easily adapted to the respective challenges. 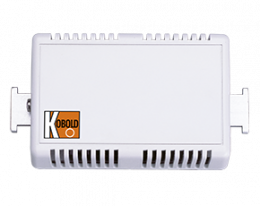 Measuring instruments with air and water currents detection sensors can be found in Kobold's wide range of products.